So, here we are at the halfway point in the conference play. What are your thoughts on the Pilots? and the rest of the WCC? I am quite disappointed that we are again battling to stay out of the cellar... we are 1 game out of the tie for last place. I am surprised to see SCU surging, and Pepp, who was looking so solid, goes 0-2 on the road this week?! Looking at the schedule, we have a tough one Thursday @GU.... then hit the road @USF and @SCU. 3 losses would be brutal, but 2 wins would really help turn things around. One A. One B+. Three C+'s. 3 C-'s. 2 D+'s. There are 5 teams fighting to stay out of the bottom 4. Pilots get USD at home, but USF on the road. UOP on the road, and LMU at home. I figure whoever can steal a game or two from the top 5 (realistically BYU, SCU and PU) will have the advantage. Pilots get BYU and PU at home. There's a chance, if they can keep up the tough D, and finish better. 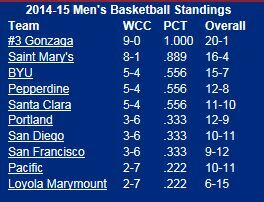 As far as how the WCC standings will play out...obviously GU 1, SMC 2. BYU and Pepperdine likely stay in a battle for 3/4 with favorable second-half schedules. Santa Clara up there with five wins right now but I don't see that lasting. Five of remaining nine games are away and two of the home games are probable losses against Gonzaga and SMC. Probably SCU, USD, USF, and UP in a dogfight for 5 through 8 at this point. For the Pilots, split/sweep/split/split after the Gonzaga game would be a strong enough finish and get them to 8-10...which would probably be the minimum required to avoid the first round. Postseason guesses - Gonzaga NCAA tourney (as a 2 seed, I think SMC will get them either in Moraga or in Vegas and knock them down a line), SMC NCAA tourney (12 seed), BYU NIT, Pepperdine CBI, Portland CIT (at home against Cal Poly). What the heck happened to the Pilots? This was a team that entered WCC play with a solid record of 9-3. They've gone 3-6 since and have just one win over a team above them in the standings. Last year's leading scorer, Kevin Bailey, missed eight games from early December thru early January. His return has not sparked the Pilots offense as many expected it would. Maybe the most important roster shake-up this team has faced this year was the loss of back-up big Riley Barker. Barker went down for the season the same game Bailey made his return. Barker was an integral part of the Pilots' rotation and gave them the WCC's second (after Gonzaga) most imposing front line. While their offense has been stagnant, the defense has fallen apart. The Pilots gave up more than 1.1 points per possession on just two occasions in the non-conference. In conference play, they've given up less than 1.1 points per possession just twice. Complete reversal of fortune on defense. If the defense isn't fixed, this team is primed for a nose-dive. The Pilots have toppled to #8 in Maupin's "power rankings." I think he sums up the Pilots quite well: "Portland is perhaps the hardest team to understand in the WCC. All of the pieces are there... Somehow the whole is not greater than the sum of the parts."